Are you a food enthusiast eager to sample all the myriad culinary specialties France has to offer (and beyond?) If so, a whirl at the Grande Epicerie, coveted by mny as the "creme de la creme" of gourmet Paris food markets, is in order during your next trip to the French capital. Part of the chic Bon Marché department store, this high-end supermarket is flush with gourmet and artisanal foodstuffs, from truffle oils and butter sauce in caviar to fresh pastries and luxury chocolates, countless varieties of cheese, fresh produce and artisan teas: in short, anything and everything a food lover might dream up can be found under a single roof. The "Haute Couture" Destination for Food Lovers? It's not an exaggeration to say that it's a bit like a "haute couture" emporium of food: famous chefs and even fashion designers have put their names on some of the exclusive products and brands peddled at the Epicerie, and it's a favorite place to shop for the well-to-do residents of the St-Germain quarter. We also highly recommend it for unique and luxurious gifts to take back home with you: it's definitely one of my own favorite places to shop for Christmas and holiday gifts in Paris. The high-end supermarket is located within the Bon Marché department store complex on the stately Rue de Sevres. Impossible to miss, the opulent buildings are nestled in the chic 7th arrondissement near the St-Germain-des-Prés neighborhood and Musée d'Orsay; the Eiffel Tower lies not far to the southwest. Address: 38 rue de Sevres, 7th arrondissement. Savory grocery: The savory section is where to head to find oils, vinegars, sauces and chutneys, pates, foie gras, luxury salts and dried spices, rice and pasta, savory crackers, snacks and appetizers, and other items. Top luxury brands include Maison de la Truffe (specialized in truffle oils and whole truffles) or Carla. Sweet grocery: Head here for luxury-brand chocolates, confectionary, biscuits, jams, honey and conserves, and other products for foodies with a sweet tooth. You can find high-grade whole bars of chocolate or cocoa from brands like Valhrona and the famed hot chocolate maker Angelina, or macarons from Charaix. Teas and Coffee: Connoisseurs of tea and coffee will find themselves in heaven here: teas from luxury French houses Mariage Freres or Kusmi Tea line the aisle, alongside high-grade whole bean coffee from brands such as Illy or Vérantis. Wine shop: In the cave (cellar) at the Epicerie, find a wide selection of excellent French and international vintages, as well as liqueurs, digestifs, champagnes, whiskies, and accessories for the wine-conscious. Fresh produce: The fresh produce section (pictured on this page) peddles nothing short of the freshest seasonal fruit, vegetables, and herbs, mostly from local and European farmers. 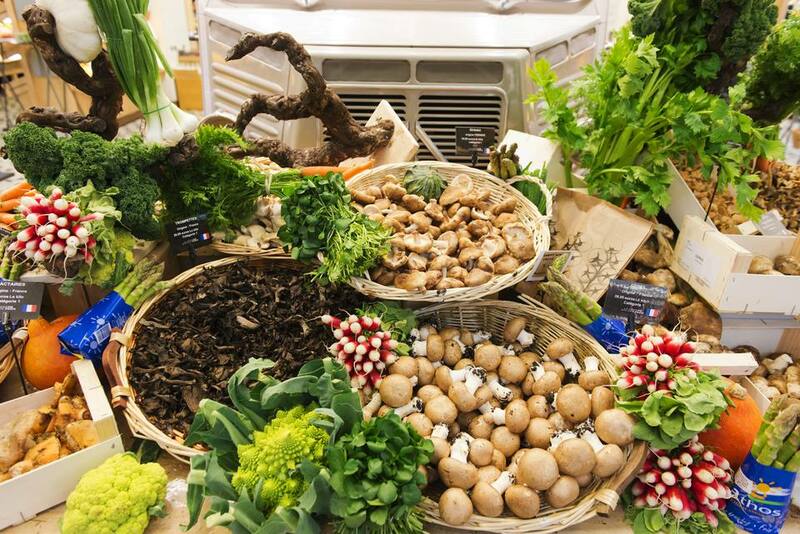 It's certainly not the least expensive place in town to procure high-quality produce-- places such as the Aligre market offer a true bargain in comparison-- but if you need to stock up on gourmet fresh and packaged goods in one stop, it's a good choice. Cheese: Sample delicious French and international cheeses here, then have as much as you want cut for you from blocks. Charcuterie: Sausages and meats of only the highest grade and quality are sold here. There's also a fishmonger next door, selling fish and high-grade shellfish. Bakery and patisserie: Freshly baked bread and a selection of luxury patisseries are sold in this section. Along with the best traditional patisseries (pastry shops) in Paris, the Grande Epicerie is a good place to sample delicious French treats. The Grande Epicerie's deli (traiteur) offers delivery and catering services in France, and ships dry and canned goods to most countries in Europe. See this page to shop and order online, and this page for catering services. If you don't have much extra space in your suitcase but don't want to miss out on sending a few prized products homeward, this can be a good option. Holiday and Christmas window decorations at both La Grande Epicerie and the other buildings of the Bon Marche are always delightful and expertly deployed, and part of the enjoying Paris department store holiday decorations campaign that brings festive cheer to the city every year. Look out for these starting from mid-November, when Christmas lights in Paris generally start getting switched on.